Why, Klapper and Chapler are similar? Baruch, do you have a better res version of this thigie? Also, can you send me an un-cropped version. TY. Can’t read the wording, Baruch? does it mention anything from where he originated from? The shul I davened at growing up, Young Israel of Spring Valley, had a Rav there for many years named Heshy Chapler. His brother still davens there every now and then. I believe that he orginally came from Passaic, so I am assuming this is his father’s grave. Anybody have any thoughts? A.R. thanx for the priceless clue. Rabbi Heshy Chapler z”l was a grandson of the Rav. I just spoke to his brother who you mentioned above. i don’t have the exact details yet, hope to fill in the void by the morrow after speaking to a great great grandkid. Rabbi Chapler was related (2nd cousin) to the Modzidtzer rebbe and a grandson of the famous Kuzmirer rebbe z’l. The Rav came in 1909 with 2 kids, these grandkids are from a 3rd kid who wasn’t able to come to America then. Regarding the location, he told me that he’s buried in the Old Tiferes Israel cemetery, Passaic Area. i sent an email to the Rabbi of that Shul and am awaiting a call back from the Great great grandkid, mentioned before. What is the exact linage to the Kuzmierer Rebbe? Farshlufen, Thanx for the link, awesome! That small bio pretty much says it all. Hope still to get the exact location IY”H. the first Modizer Rebbe and we are cousins of the Modizer. My grand father was Rav Mendel Chapler and my father was the son that was left in Europe and came to America in 1921. My father’s name was Eliyahu Yescheskal which are names from the Kuzimer Lineage. My grandfather’s oldest son was Avraham Abba, who was named after his father who was niftar during World War 1 in Poland from natural causes. Where is your father burried? I know he lived in the catskill region where he served as Shochet, between Liberty, Swan Lake and Harris. So you dont have the exact information as to the name of the daughter of the Kuzmireer rebbe etc? What else can you share on the Chpaler Rabbis? My father is buried in Har Hazashim with my mother and my brother Heshy Chapler. I don’t have the information as to the daughter of the Kuzmiere rebbe who we shtam from . There is a young Kuzimiere rebbe who lives in Jerusalem who comes to America every year to collect money. His gabbai told me that this rebbe, who is from the Modizer dynasty, has the exact lineage and history of the Kuzimiere generations. He has not yet shared the particulars with me. Do I know you? You seemed to know a little bit about my father. If you have more questions, I will be happy to answer them. It is hard to just come up with stories out of the blue. I don’t think you know me, and the only knowledge I have on you father is from searching around to find out more on your Grand-father who seems to have been an influential Rabbi in his time. I have a passion to Rebbes, Rabbis and History and therefore an interest in how Rabbi Chapler was a descendant of one of the great Chasidic Dynesties in the History of Chasidus, most famous for there unique works and new meanings they brought to Chasidic Music and Songs. May thier Zechus be Magin on yourself and your family and loved ones, in all your wishes and efforts. 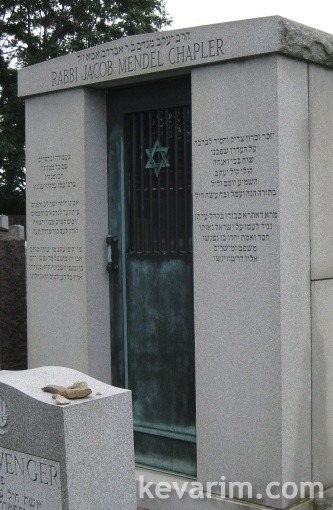 Mrs. Finer (Chapler), can you kindly have any of your family members, who visit him often to send us a better picture of his impressive Ohel – the wording on this one ain’t legible. Thank you. I remember a story when I was seven years old in 1948, July. My grandfather was staying with us in Liberty. He was suffering a heart attack one night. The ambulance was on the way. My brother Heshy asked him if he was scared. He answered in Yiddish a yid hot nish moira. A jew is not afraid. He did leave the hospital but was niftar one morning soon afterward from another heart attack. He also was one of the Rebbaim who would fahar the bochrim from Torah Vadaas Yeshivah for Smecha. I heard that my grandmother, from about 1938 to when she was niftar in 1941, their livingroom was full of refuges, would send my brothers out to buy whatever special spice or food each of the guests in her house wanted. My brother El Konah, Charles, still remembers going to the store. I know that my grandfather was very erlich and was loved as a rav in Tiferesh Israel for over forty years. It was hasgocha protis that my father remained in Europe until he was 21, because our branch of the family is the only frum branch. My uncle and my aunt’s children are not frum and have even started r”l intermarrying goyim. I will try to get in touch with the Kuziemier’s gabbai and see if he can trace our liniage. I know that my father knew it perfectly, but I was not smart enough to write it down. As I wrote before, R’ Heshy Chapler was the Rav in my parents shul, Y.I.S.V. I remeber him being a very erlich yid, beloved by the whole Monsey community, apparently he shared the same DNA as his grandfather. Rav Heshy was a very unassuming talmid chacham and before he was the Rabbi of the shul he was simply known as “Heshy”. As a kid I once had a hashkafic question and someone told me to ask Heshy and not the Rav of the shul. Only later did he become the actual Rav. He had chasidic influences and was, if I remember correctly, a talmid of Rav Schorr. I happened to be in Eretz Yisrael for both his Levaya and his Rebetzin Suzie’s as well. The current Rav of YISV is his son-in law, meaning a greatgreat grandaughter of Menachem Mendel. Heshy was a talmid of Rav Schorr in Torah Vadaas, but also spent at least five year in Bais Medrosh Elyon in Monsey. His Chavrousa for six years was Rav Chaim Epstein, who is the Rosh HaYeshiava of a Yeshiva in Brooklyn. He did inherit my grandfather and father’s genes in that he was very erlich and a tremendous Baal Chesed. He spent his last years focusing on Shalom Bais problems and was able to save many marriages. I remember sleeping one shabbos at Heshy’s house when at one o’clock in the morning a man came complaining about his wife. Heshy calmed him down and he left. We thought we would be able to get a night’s sleep when at 5 0’clock that same morning the wife came knocking on the door. How he had the patience and strength to listen and deal with all their problems is beyond me. I was ready to shot them both and end their marital problems. By the way, Chummie Newman, Heshy’s daughter and the wife of the present Rav of the Young Israel is Menachem Mendel’s great grand child. Any update on the location? Do you know the name or exact address of the Cemetery for GPS use? Between his son Rabbi Tzvi Hirsch (Heshy) Rabbi of YI of Speing Valley, and his wife Chana Serka Chapler. Does anyone have any info how he was a descendant of Rav Chezkel Mikuzmir?